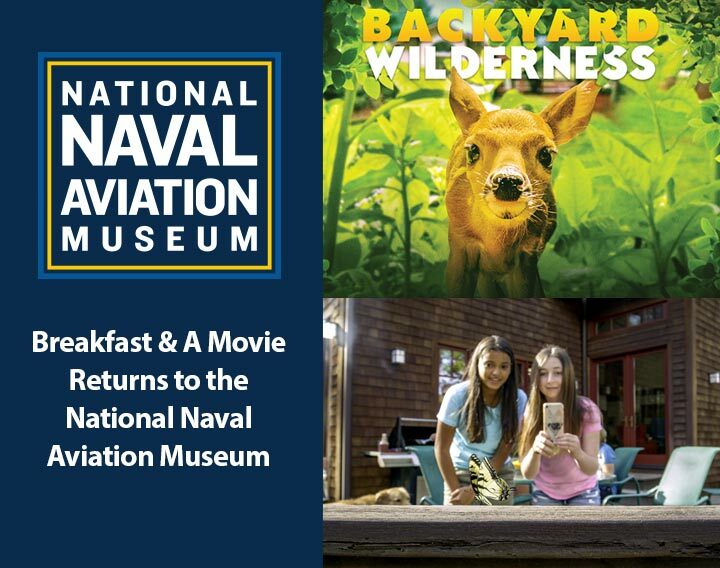 Feb. 4, 2019, Pensacola, Fla. Breakfast & a Movie Series returns to the giant screen at the National Naval Aviation Museum, located aboard Pensacola Naval Air Station, every Tuesday in February. Visitors are invited to enjoy Chick-fil-A breakfast and choice of beverage from the new refreshment counter followed by a presentation and movie in the Giant Screen Digital Theater. On Tuesday, February 5, Backyard Wilderness will surprise and entertain viewers with the unexpected delights of nature that are in our own neighborhoods and communities. Spanning a seasonal year around a suburban home, the film displays a stunning array of unique wildlife imagery and behavior – all captured by cameras mounted inside dens and nests and moving along forest floors and pond bottoms. The film reveals the animal inhabitants in rare and breathtaking detail. The film reminds us that Wi-Fi is not the only connection that matters and that sometimes in ordinary places, you can uncover extraordinary things that can transform you forever – you just need to step outside. The Museum Historian will present stories of naval aviation history as the Museum Curator and Museum Archivist share artifacts from the museum’s extensive historical collection. PLEASE NOTE: All non-Department of Defense (DOD) ID holders must enter and exit through the West Gate of Naval Air Station Pensacola at the following address: 1878 South Blue Angel Parkway, Pensacola, FL 32507. All guests aged 16 and over must have a valid photo ID to enter the base. Media Note: For more information about the National Naval Aviation Museum or Foundation, contact Malerie Shelton at (850) 453-2389 or mshelton@navalaviationmuseum.org. The National Naval Aviation Museum, one of TripAdvisor’s “Top 25 Museums in the United States,” features nearly 350,000 square feet of displays and is one of the world’s largest aviation museums. Located aboard Pensacola Naval Air Station, the facility boasts more than 150 beautifully restored aircraft representing Navy, Marine Corps and Coast Guard aviation, and is one of Florida’s most visited museums. Be sure to visit Hangar Bay One, displaying aircraft of the post-WWII era including presidential helicopter, Marine One. Among the countless things to touch, see and experience are thrilling 3D and HD flight simulators and the new Blue Angels 4D Experience. Don’t miss the drama and power of the new laser powered Giant Screen digital theater. The Cubi Bar Café offers a unique dining experience, and the Flight Deck Store is the perfect place to find a souvenir that captures the spirit of Naval Aviation. Museum admission is FREE and open to the public. The National Naval Aviation Museum is open daily from 9 a.m.–5 p.m. For more information, visit www.NavalAviationMuseum.org.